In 1982 a remarkable event took place. At the University of Paris a research team led by physicist Alain Aspect performed what may turn out to be one of the most important experiments of the 20th century. You did not hear about it on the evening news. In fact, unless you are in the habit of reading scientific journals you probably have never even heard Aspect's name, though there are some who believe his discovery may change the face of science. Aspect and his team discovered that under certain circumstances subatomic particles such as electrons are able to instantaneously communicate with each other regardless of the distance separating them. It doesn't matter whether they are 10 feet or 10 billion miles apart. Somehow each particle always seems to know what the other is doing. The problem with this feat is that it violates Einstein's long-held tenet that no communication can travel faster than the speed of light. Since traveling faster than the speed of light is tantamount to breaking the time barrier, this daunting prospect has caused some physicists to try to come up with elaborate ways to explain away Aspect's findings. But it has inspired others to offer even more radical explanations.University of London physicist David Bohm, for example, believes Aspect's findings imply that objective reality does not exist, that despite its apparent solidity the universe is at heart a phantasm, a gigantic and splendidly detailed hologram. To enable people to better visualize what he means, Bohm offers the following illustration. Imagine an aquarium containing a fish. Imagine also that you are unable to see the aquarium directly and your knowledge about it and what it contains comes from two television cameras, one directed at the aquarium's front and the other directed at its side. As you stare at the two television monitors, you might assume that the fish on each of the screens are separate entities. After all, because the cameras are set at different angles, each of the images will be slightly different. But as you continue to watch the two fish, you will eventually become aware that there is a certain relationship between them. When one turns, the other also makes a slightly different but corresponding turn; when one faces the front, the other always faces toward the side. If you remain unaware of the full scope of the situation, you might even conclude that the fish must be instantaneously communicating with one another, but this is clearly not the case. In addition to its phantomlike nature, such a universe would possess other rather startling features. If the apparent separateness of subatomic particles is illusory, it means that at a deeper level of reality all things in the universe are infinitely interconnected.The electrons in a carbon atom in the human brain are connected to the subatomic particles that comprise every salmon that swims, every heart that beats, and every star that shimmers in the sky. Everything interpenetrates everything, and although human nature may seek to categorize and pigeonhole and subdivide the various phenomena of the universe, all apportionments are of necessity artificial and all of nature is ultimately a seamless web. Although Bohm concedes that we have no way of knowing what else might lie hidden in the superhologram, he does venture to say that we have no reason to assume it does not contain more. Or, as he puts it, perhaps the superholographic level of reality is a "mere stage" beyond which lies "an infinity of further development". Then in the 1960s Pribram encountered the concept of holography and realized he had found the explanation brain scientists had been looking for. Pribram believes memories are encoded not in neurons, or small groupings of neurons, but in patterns of nerve impulses that crisscross the entire brain in the same way that patterns of laser light interference crisscross the entire area of a piece of film containing a holographic image. In other words, Pribram believes that the brain is itself a hologram. Pribram's belief that our brains mathematically construct "hard" reality by relying on input from a frequency domain has also received a good deal of experimental support. It has been found that each of our senses is sensitive to a much broader range of frequencies than was previously suspected. Researchers have discovered, for instance, that our visual systems are sensitive to sound frequencies, that our sense of smell is in part dependent on what are now called "osmic frequencies", and that even the cells in our bodies are sensitive to a broad range of frequencies. Such findings suggest that it is only in the holographic domain of consciousness that such frequencies are sorted out and divided up into conventional perceptions. But the most extraordinary aspect of Pribram's holographic model of the brain is what happens when it is put together with Bohm's theory. For if the concreteness of the world is but a secondary reality and what is "there" is actually a holographic blur of frequencies, and if the brain is also a hologram and only selects some of the frequencies out of this blur and mathematically transforms them into sensory perceptions, what becomes of objective reality? Put quite simply, it ceases to exist. As the religions of the East have long upheld, the material world is Maya, an illusion, and although we may think we are physical beings moving through a physical world, this too is an illusion. We are really "receivers" floating through a kaleidoscopic sea of frequency, and what we extract from this sea and transmogrify into physical reality is but one channel from many extracted out of the superhologram. In a universe in which individual brains are actually indivisible portions of the greater hologram and everything is infinitely interconnected, telepathy may merely be the accessing of the holographic level. It is obviously much easier to understand how information can travel from the mind of individual 'A' to that of individual 'B' at a far distance point and helps to understand a number of unsolved puzzles in psychology. In particular, Stanislav Grof feels that the holographic paradigm offers a model for understanding many of the baffling phenomena experienced by individuals during altered states of consciousness. In the 1950s, while conducting research into the beliefs of LSD as a psychotherapeutic tool, Grof had one female patient who suddenly became convinced she had assumed the identity of a female of a species of prehistoric reptile. During the course of her hallucination, she not only gave a richly detailed description of what it felt like to be encapsuled in such a form, but noted that the portion of the male of the species's anatomy was a patch of colored scales on the side of its head. What was startling to Grof was that although the woman had no prior knowledge about such things, a conversation with a zoologist later confirmed that in certain species of reptiles colored areas on the head do indeed play an important role as triggers of sexual arousal. The woman's experience was not unique. During the course of his research, Grof encountered examples of patients regressing and identifying with virtually every species on the evolutionary tree (research findings which helped influence the man-into-ape scene in the movie Altered States). Moreover, he found that such experiences frequently contained obscure zoological details which turned out to be accurate. In later research, Grof found the same range of phenomena manifested in therapy sessions which did not involve the use of drugs. Because the common element in such experiences appeared to be the transcending of an individual's consciousness beyond the usual boundaries of ego and/or limitations of space and time, Grof called such manifestations "transpersonal experiences", and in the late '60s he helped found a branch of psychology called "transpersonal psychology" devoted entirely to their study. Although Grof's newly founded Association of Transpersonal Psychology garnered a rapidly growing group of like-minded professionals and has become a respected branch of psychology, for years neither Grof nor any of his colleagues were able to offer a mechanism for explaining the bizarre psychological phenomena they were witnessing. But that has changed with the advent of the holographic paradigm. The holographic paradigm also has implications for so-called hard sciences, such as biology. Keith Floyd, a psychologist at Virginia Intermont College, has pointed out that if the concreteness of reality is but a holographic illusion, it would no longer be true to say the brain produces consciousness. Rather, it is consciousness that creates the appearance of the brain -- as well as the body and everything else around us we interpret as physical. Such a turnabout in the way we view biological structures has caused researchers to point out that medicine and our understanding of the healing process could also be transformed by the holographic paradigm. If the apparent physical structure of the body is but a holographic projection of consciousness, it becomes clear that each of us is much more responsible for our health than current medical wisdom allows. What we now view as miraculous remissions of disease may actually be due to changes in consciousness which in turn effect changes in the hologram of the body. 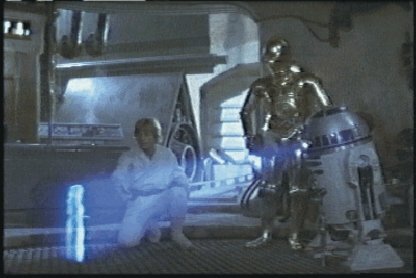 Similarly, controversial new healing techniques such as visualization may work so well because, in the holographic domain of thought, images are ultimately as real as "reality". Even visions and experiences involving "non-ordinary" reality become explainable under the holographic paradigm. In his book "Gifts of Unknown Things", biologist Lyall Watson describes his encounter with an Indonesian shaman woman who, by performing a ritual dance, was able to make an entire grove of trees instantly vanish into thin air. Watson relates that as he and another astonished onlooker continued to watch the woman, she caused the trees to reappear, then "click" off again and on again several times in succession. Michael Talbot was born in Grand Rapids, Michigan on September 29, 1953. He was originally a fiction/ science fiction author. He also contributed articles to The Village Voice and other publications. His non-fiction books include Mysticism And The New Physics, Beyond The Quantum, and The Holographic Universe. Talbot often referenced Stanislav Grof, whose work on Holotropic Breathwork was also of obvious influence. Talbot attempted to incorporate spirituality, religion and science to shed light on truly profound questions that we have struggled with since the genesis of humanity. In 1992, Talbot died of lymphocystic leukemia at age 38.